Quick Mount System uses 300degree dual inlet Copreci valve. This kit is designed to give to option of rear or side gas inlets. Fits all standered type burner pans. Those with 3/8" internal, 3/8" external, or 1/2" external threads on the end of the burner tube. 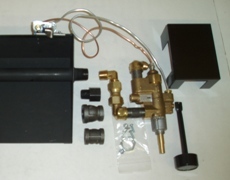 Kit includes fittings, pilot assembly, insulated heat shield and instructions.